Artist and UA art alumna Linda Rae Bell died at her home in Northport, Monday, June 20, 2017. Bell earned her MA in art history from The University of Alabama and she served on the staff in the Department of Art and Art History as slide curator in the 1990s, overseeing a collection of over 75,000 slides and other image resources. Bell, who worked under the name “Elles Beles,” specialized in textile art. 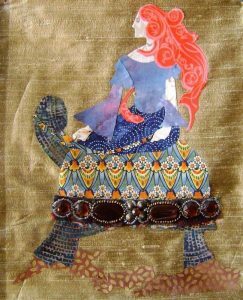 Much of her graceful, sensual art was created in fabric collage inspired by music and musicians, fairytales (traditional and her own), 1920s and ’30s fashion and other themes. Recent exhibitions were at the Bama Theatre’s Greensboro Room Gallery, the Jemison-Van De Graaff Mansion and the Mildred Westervelt Warner Transportation Museum in Tuscaloosa; Lowe Mill Arts and Entertainment in Huntsville and the Daniel Day Gallery in Birmingham, a music and art venue. 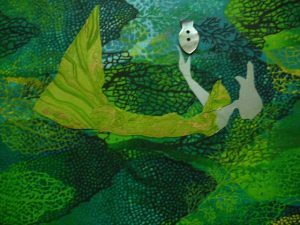 In 2015, she presented a body of work at the Warner Transportation Museum, Aquatic Gardens: Travels through the Imagination, interpreting watery narratives including Alabama rivers with subjects such as Cahaba lilies and mythical underwater creatures. In lieu of flowers, her family suggests that donations be made to the American Diabetes Association. Her obituary is posted here.